The objective of the restoration is to have a complete airplane in WWII stock condition for static display. 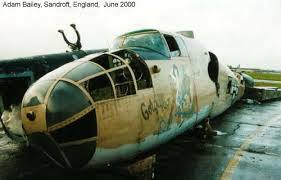 Given the condition of the plane when recovered, a restoration to flying condition would require a complete reconstruction of the aircraft and would be extremely costy. Sandblasting was carried out by a specialized company. This operation took place during the very cold month of December 2009.&nbsp;Sandblasting was essential to stop the corrosion of an airframe that suffered years of neglect in the open. It is currently displayed on a supporting frame and will be re-installed on the airplane once the nose gear weel has been refurbished. The bombardier's compartment windows frames have been fixed. Like for the nose gear, this gear is currently displayed and will be re-installed once the centre section has been refurbished. It's very painful to work in a B-25. From the outside it's looking big, when you are inside it's small and cramped. Autumn 2017- design and manufacture of mock Browning .50 gun. This dolly was needed to transport the B-25 to the fort of Lantin for the BMVT rally. January 2018-The equipment in the nose gear well is removed to be refurbished and to enable the repair of the well.